# Boil the carrot and potato without mashing too much, dice. # Put the diced carrot, potato, gherkins and canned green peas into a deep bowl. # Add 7 tbsp mayonnaise, and mix them without mashing the ingredients. # Place the salad on a flat service plate, place the remaining 1 tbsp mayonnaise on the top and flatten it. # Garnish the salad by placing gherkin slices on the top. 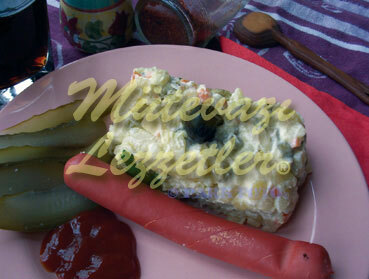 Note: Because of the salt in the mayonnaise and in the pickle, there is no need to add more salt.